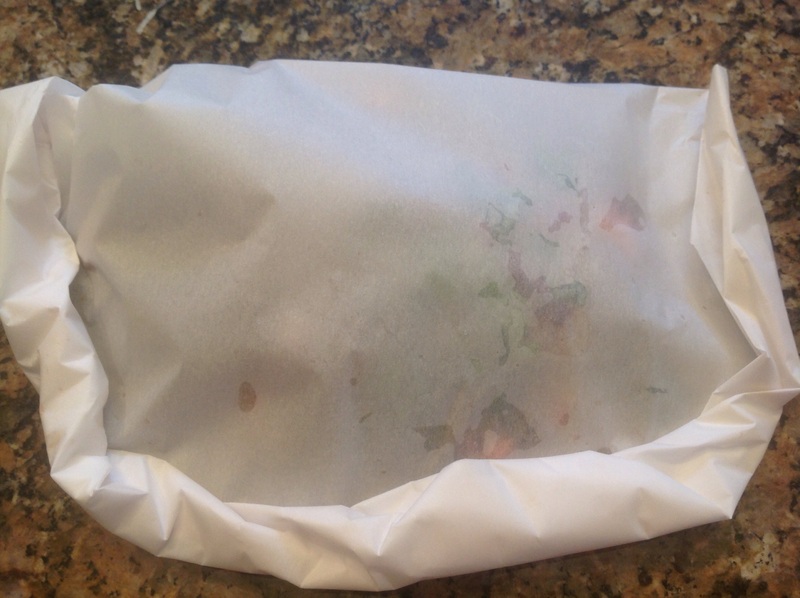 Cooking “En papillote” is a fancy way to say a dish is cooked in a packet, usually made out of parchment paper, which seals in all the flavorful juices as it bakes. It is so easy, it can get a weeknight meal on the table in mere minutes. The whole packet is brought to the table at each guest’s place and with a fourish, cut open with scissors, to simultaneously release the sublime aromas and reveal the beautiful dish. It is fun and dramatic. 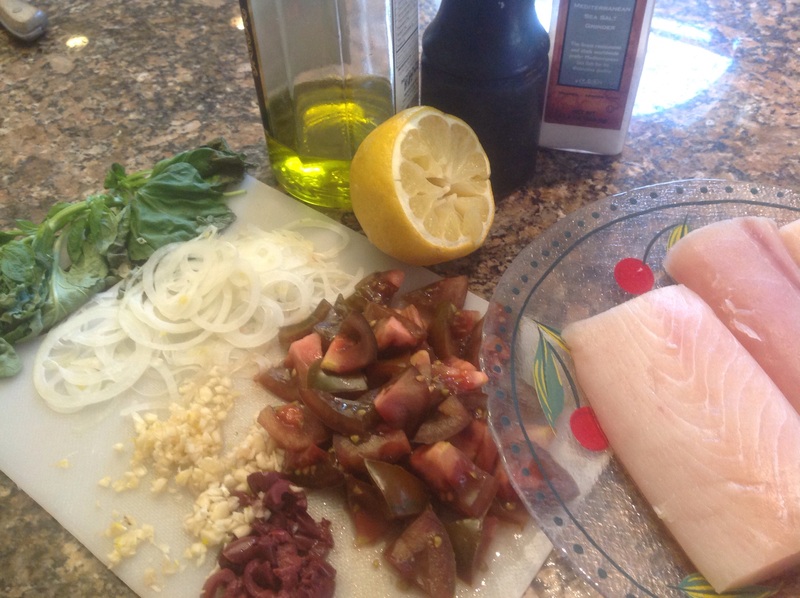 In this particular dish I chose Provençal flavors to accompany Mahi-Mahi fillets. The measurements are approximate. 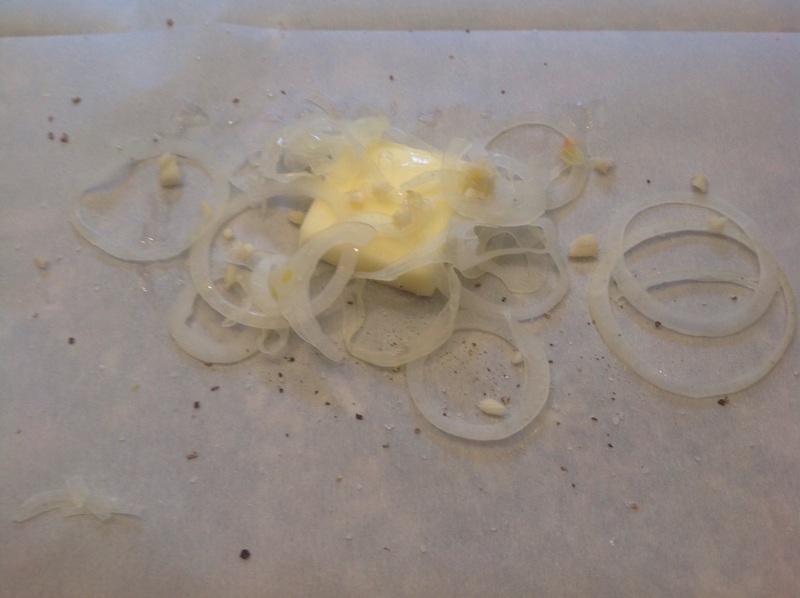 For each serving, on a piece of parchment paper about 12″ wide, off-center place a dab of butter and spread thinly sliced onions and minced garlic about the length of the fish fillet. Add the fish fillet and season simply with salt and pepper. Scatter chopped fresh tomatoes, sliced Kalamata olives, more minced garlic, slivers of fresh basil and finish with a squeeze of fresh lemon juice or white wine. Add capers if you like them. The edges are then folded from one end to the other, bottom to top and tucking the ends under to create a half moon pillow. Brush a light coating of oil on the packet before baking so it browns and crisps up nicely as it bakes. The packets are baked at 425F for 10-12 minutes, depending on the thickness of your fish fillet, on a baking sheet. Use a spatula to transfer the packets to each serving plate. Voilà! Provençal Mahi~Mahi En Papilotte! Make sure to serve some crusty bread to sop up the flavorful cooking juices. Taking my talented fellow bloggers at Fiesta Friday on a trip to Provence today! 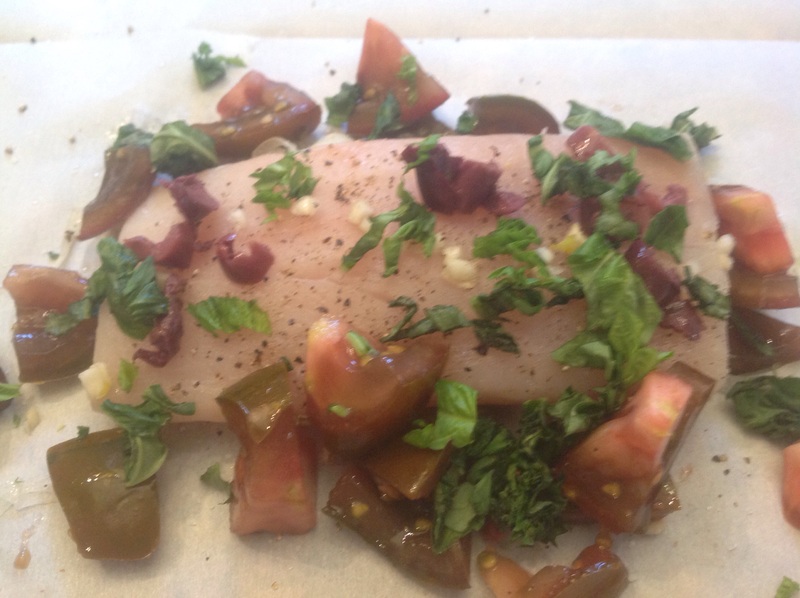 This entry was posted in Recipes and tagged Mahi mahi en papillote, provençal mahi mahi fillets en papillote by Johanne Lamarche. Bookmark the permalink. Yum!! Looks so moist & delicious Johanne! Thank you Naima! It was and made it twice in a week! Needed your styling skills on this one! This looks delicious! 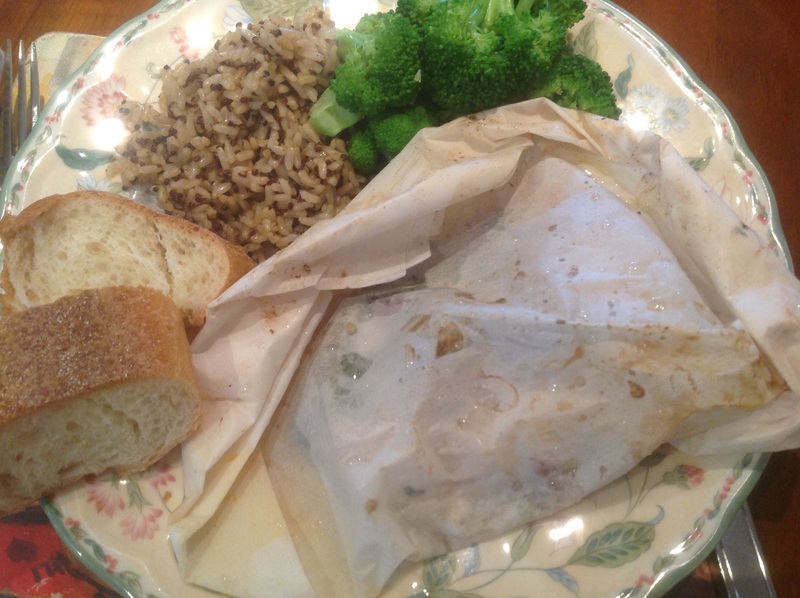 I’ve only ever baked salmon wrapped in parchment paper, so I really need to give this another go. Thanks for joining the fun at Fiesta Friday!! Always good to bake any fish en pailotte and salmon would be delish too! Happy FF! And I was 5 months pregnant on that trip! 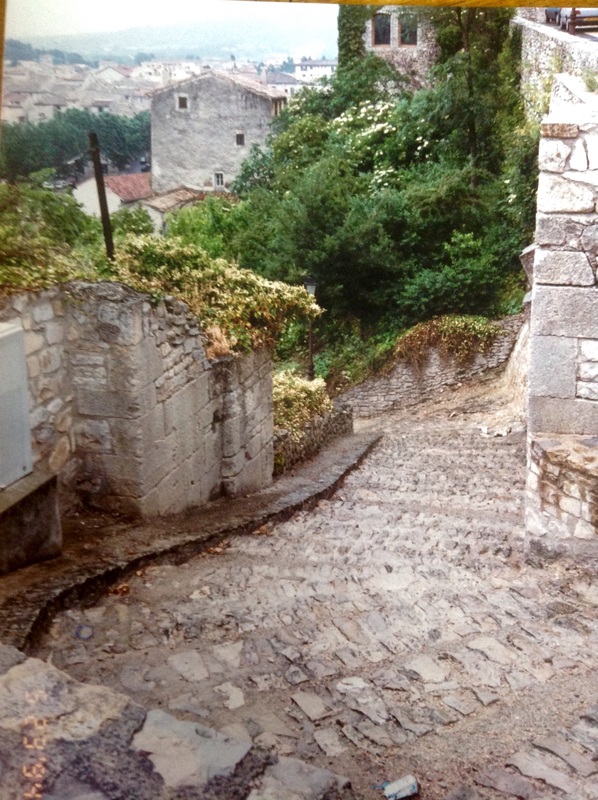 Love Provence…its food, people, setting, artists! Time to go back, sigh. I’m sure that was one moist delicious dish! It sure was Julie! Thank you. I’ve never done this before but I love the idea! I normally bake my fish wrapped in a foil parcel but will have to try it this way. This dish looks delicious! You will love it Michelle! It’s so easy and the variations are endless. Like Ginger, the only fish I have used in parchment is salmon. Mahi Mahi – I don’t think I can get that here! I have also used pork tenderloins in parchment with great results 🙂 It is a fun and a good way to cook fish! Bonus – it is a Weight Watcher’s recipe! beautiful fillet, moist and luscious. I forget that en papillote is not difficult to do, and so worthwhile. Me too! Blogging does force one to get more creative and going back to papilotte cooking was a happy result of my stepping up my game. Beautiful recipe – Perfect for the start of now. I look forward to making this. This is super easy and really flavorful. Hope you enjoy it as much as we do! This looks so yummy Johanne. 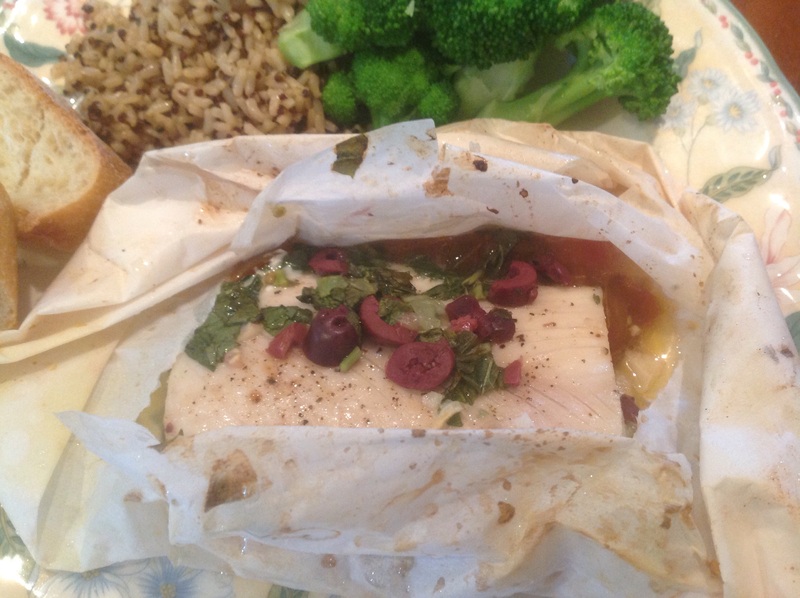 I have never tried baking fish in parchment but your recipe is tempting me – garlic, olives, basil, lemon hmmm…yum! Give in to the temptation Indu! You won’t be disappointed!